After 5 years of moderate use, it was time to perform a basic maintenance of my BigIR Mrk III and I also wanted to take a look inside the Element Housing Unit (EHU). I had a spare EHU gasket at hand - a must if you are opening the EHU. The gasket is compressed by the cover and with time, it will stay deformed even when the cover is removed so it needs to be replaced if the EHU is open. After so many reports of broken plastic drive shafts in the SteppIR Yahoo Group and knowing that my shaft is one of the "gray plastic" versions (with an increased incidence of failures), the shaft was the first thing to inspect upon opening the EHU. Well, I wasn't terribly surprised! I sort of expected to see something like this - just glad that i caught it on time. 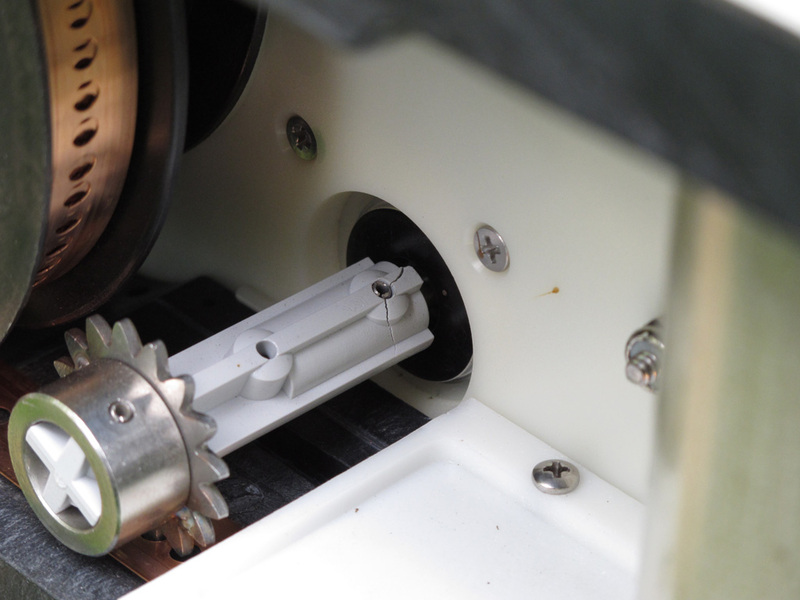 The shaft was cracked around the slotted spring pin attaching it to the stepper motor shaft. It was still holding but probably not for long as the crack was going all the way trough the plastic. I checked the SteppIR web site and as it turns out they are now offering "an updated design" shaft - admitting in a way that the problem with the original shaft was a bad design and/or choice of material. I called to ask for a replacement, because I wanted to fix it myself and found out that it will cost me $30 (shaft, gasket and shipping) to do their job. I didn't feel like shipping the whole EHU and waiting weeks to get it back - and yet I had to pay out of my pocket for their mistakes, while saving them labor and money - I guess this is how companies do business nowadays. 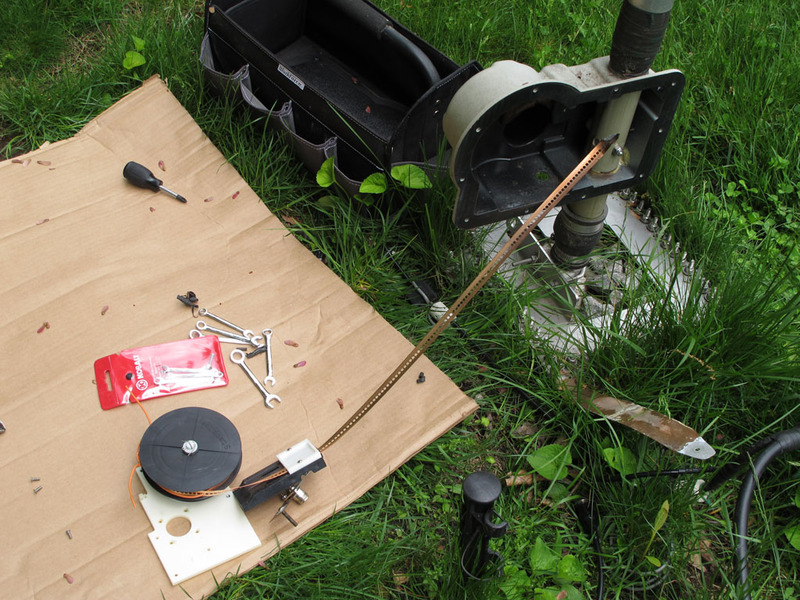 I was also told that I have take apart the whole antenna and have the EHU on my bench in order to be able to perform the repair. Disassembling the whole antenna - I think not! To disassemble the antenna, I had to cut the 3/4" PVC element guide tube (inside the 2 Element Extension Tubes) and then join it (glue it) with a 3/4" coupler when putting the antenna back together. Taking everything apart is too much work and I wasn't trilled about extra joints in the Extension Tube liner (not to mention weatherproofing the assembly). I decided to go against the SteppIR recommendation and repair it in the field - it turned out not to be a big deal. There are 3 external connectors which have to be released - the motor control connector, the RF connector on the bottom and the ground terminal. It is fairly easy to remove them - 2 screws for the RF connector, a couple of nuts and washers for the ground terminal and a large plastic nut for the motor control connector. Next step is to detach the internal assembly - 3 screws on the outside of the EHU (around the motor cavity bump). One of these screws has a Nyloc nut on the inside, the other two screws go directly into the white plastic mounting plate of the internal assembly. One have to be very careful when pulling the internal assembly out in order to avoid any damage to the copper-beryllium tape. This tape must be protected from any sharp bends or kinks as they are almost permanent. If you are doing this repair - release more tape from the spool if needed and lay the assembly down, making sure the tape curves gently. Don't try to pull the end of the tape from the fiberglass tube - there is a plastic stopper at the end - just rotate the sprocket by hand releasing more tape from the spool. 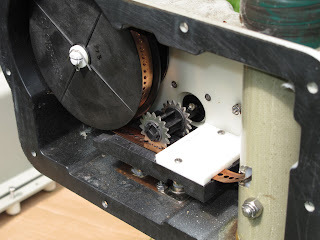 I used a piece of wire to secure the tape to the spool, threading the wire through the tape perforation so the tape doesn't spring out when it is released from the sprocket. Finally, 4 countersunk screws holding the stepper motor to the vertical white plastic plate and a cable tie securing the motor cable. 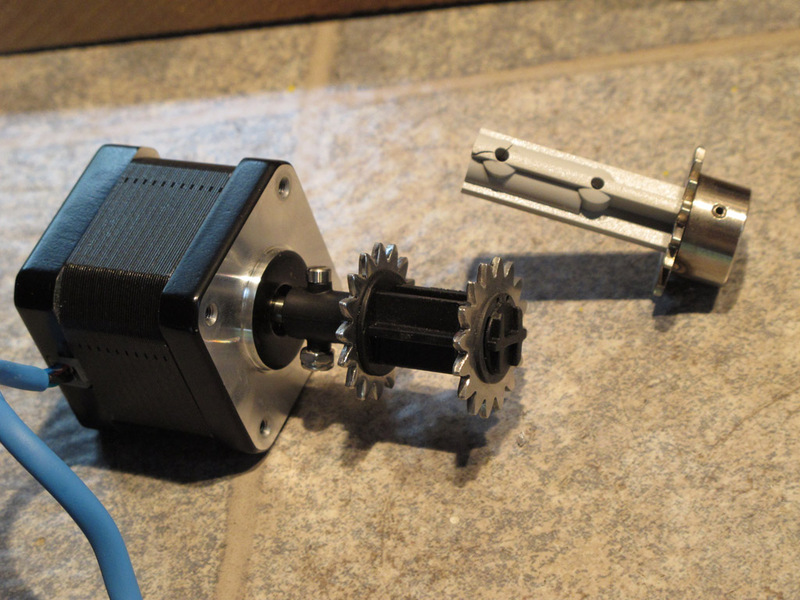 At this point the whole assembly - motor, shaft and sprocket can come out. The new element drive shaft already installed on the stepper motor shaft. This time no tension pin - a special long screw and a Nyloc nut are securing the shaft. The slotted compression pin in the old design could be part of the reason for the failure as it exerts constant pressure inside its opening in the plastic shaft. The new shaft came with two sprockets - obviously a universal version, also used in their Yagi and Dipole line of products (the inside sprocket can be removed but I left it on the shaft). Other than a different type of plastic (glass filled) and a different way to mount it on the motor shaft - the new shaft doesn't have more material around the part that forms the motor shaft sleeve. It appears stronger (thicker) only in the area between the two sprockets (the new sprockets are a bit simplified by design (no collar) and mounted by using retaining rings). The claims by SteppIR are that they have not had any failures with this "updated design" so far. The EHU with the updated design shaft in place. During re-assembly, everything goes back in the reverse order. I don't understand why it took so long for SteppIR to acknowledge and address this issue - from what I was able to gather on the Internet, this is a REALLY common problem with the original design! I was expecting see some sort of recall / replacement program - where they charge you for the part and once you return the broken part, you get a refund - this way people will not stock up on free parts if they have not had a failure - (at least in my mind - it is what a reputable company should do). P.S. I am still bothered by the fact that the drive shaft doesn't have a support bearing on the far end (opposite of the motor) - this is just a poor engineering practice (or unwise cost-saving). In addition to the rotational force, there is some radial force from the sprocket trying to grab and move the tape (mainly caused by the resistance of the tape, especially during EHU calibration - when all of the tape is already on the spool, even the motor is stalling due to the infinite resistance caused by the tape stopper ). Without a support bearing, this radial force at the sprocket end turns into an effort for a Class 2 Lever (the length of the drive shaft itself) and puts the opposite end of the shaft (near the motor shaft sleeve (which acts as a fulcrum for the same Class 2 Lever)) under stress - hence the many cases of broken drive shafts (the failure always occurs in this very point). This part of the drive shaft is already weakened because of the formed motor shaft sleeve, the tension pin holes and the additional stress from the pin itself. One can see that is not that difficult to implement a support bearing if the shaft was just a bit longer. I have now had 3 shaft failures on a 4 ele StePPi Yagi in 6 years. Not supporting the end of the shaft is incredibly bad engineering, plus using a roll pin. They should have recalled like a good Company would. One more reason not to buy SteppIR. I had EHU failure due to fatigue on the spring that recalls the elements.